Lot 599. L. Flaminius Chilo. 109-108 B.C. AR denarius (19 mm, 3.79 g, 8 h). Rome. 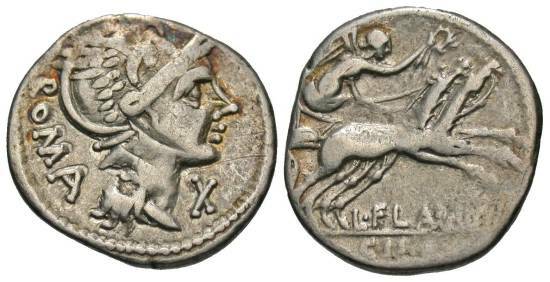 ROMA, Head of Roma right, wearing winged Phrygian helmet; X to right / L·FLAMINI//CILO, Victory driving fast biga right, crowning horses . Crawford 302/1; Sydenham 540. Nearly very fine.